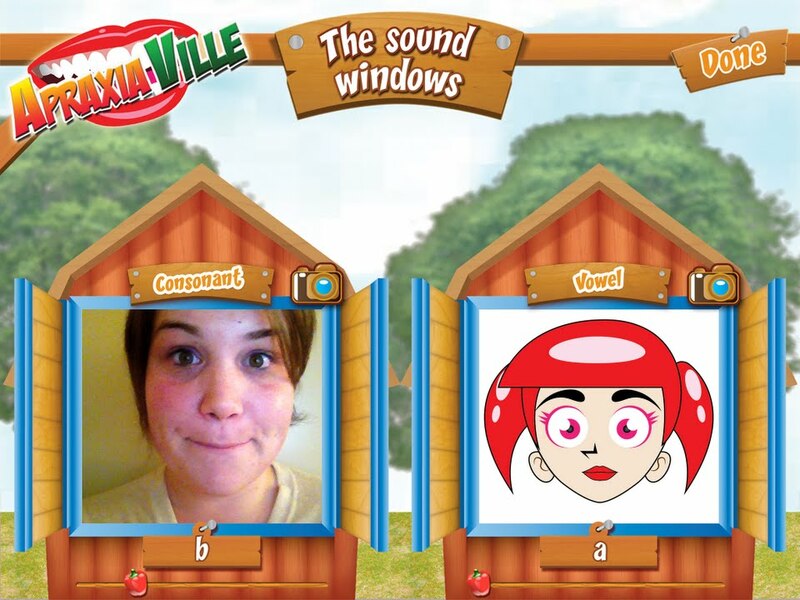 Apraxia Ville is designed for use by Speech-Language Pathologists working with children diagnosed with Apraxia of Speech. The app targets consonants and vowels in isolation, at the word level (CV & CVC), and in word sets (CV + CV or CVC + CVC). Word level motor planning – Select word families (i.e. /p, b, m/) to target in addition to at least 1 of 10 vowels at either CV or CVC level. Co-articulation – The Word Farm activity offers either 2 or 3 words to practice any CV or CVC combination as mastery at word level is successful. Creating a motor plan from word to word using target sounds is easy in this activity. Prosody – In the Word Farm (word sets), a client can practice varying intonation once articulation of the consonants and vowels become more consistent. For example, place increased stress on the second CVC word such as pan + PASS, with the pitch and loudness increasing on pass. Progress Monitoring and Homework – Homework sheets can be created based on the therapy session targets, results, and performance during the activities. Graphs showing percentages for consonants and vowels are available for reference once a child’s profile is created. Tailor-made for a Speech-Language Pathologist. Whether a child is working on basic, voluntary lip closure to a child at the word level struggling with prosody, Apraxia Ville offers an evidence-based approach to target the speech difficulties children with CAS face. Graphics and Design. The farm-theme is not too cutesy or distracting from the tasks at hand. In fact, it seemed motivating for students to “work on the farm” while in speech class. The Sound Window. Either the stand-alone activity or the window on the side of the barn, the option to put the child into the app is nothing short of amazing. When you touch the camera, the child’s face is on the side of the barn. They start begging for something to do! (data taking dream!!). Quick Play. While I added student profiles for those I will use the app consistently with, the option to quickly open an activity and begin is priceless. My favorite part! Can you tell I’m making the /b/ sound? Note taking – As long as my clients are in Smarty Ear’s Therapy Report Center (free) app, I can add a progress note regarding type of physical prompts used to illicit a specific motor movement. However, I would like this feature within the Apraxia Ville app itself. Vowel settings – I find myself wanting to use the app because of the word sets or word families for children with severe phonological difficulties. However, they do not need to work on vowels. I want to still be able to select types of vowels, but just not have them appear in the targets. Continue to be amazing. Please and thank you! The app should be used as a tool in combination with a comprehensive assessment and intervention approach. Smarty Ears did provide a free copy of Apraxia Ville, however the opinions, suggested uses, impressions, and evidence are all my own findings. I love how you have combined EBP principles with your app reviews!! Any tips as to how to use the iPad in therapy with small groups (3+)?? I’m in my school placement right now and the kids love the iPad and I love using it, but every time I try it seems like the kids are spending a lot of time waiting for “their turn” with the iPad OR crowding around it/invading other’s personal space to see (which is never good in middle school!). I’ve used all the apps I’ve reviewed in groups of 3-4 at my school placement. If available, use a projector and connect to your iPad with a VGA adaptor to project the iPad screen. Otherwise, when it’s a clients turn I have them work first then demonstrate what they are doing during their turn. For instance, when using Apraxia Ville, the student can use the mirror feature, then instruct the others to do what they did. That tends to keep the iPad frenzy at bay while each takes their turn. 🙂 hope that helps!